These days, it’s easier than ever to create a website, even if you don’t have a background in web development. However, almost no one talks about how long the process of creating a site actually takes. This means it could be tough to plan ahead and put time aside to get your project off the ground. The short answer is creating a website takes less time than you’d imagine, particularly if you’re using WordPress. In this article, we’re going to talk about what the process of developing a website looks like and how long you should expect to spend working on it. The steps you need to take to create a WordPress website are roughly the same for all projects. However, their execution can vary a lot depending on the nature of your site and its scope. In general terms, you start by planning what your site will include and how it will look. Next, you move on to getting the technical elements in place, such as a domain and hosting. Then, the real work on your website begins, and you start building its pages, writing its content, adding and customizing a theme, and more. If you have experience using WordPress and you’re using a site builder, creating a modest website with a couple of pages can take you as little as a few hours. However, that’s a best-case scenario for someone with a lot of experience under their belt. In most cases, the process of creating a WordPress website takes a lot longer. Even after the website is finished, it may require some tweaks and revisions until it looks and works just like you want it to. In summary, it’s nearly impossible to give you an exact estimate on how long it takes to build a WordPress website. In our experience, if you’re entirely new to the platform, it’ll take you at least a few days to familiarize yourself with how it works on the surface. If you’re using a theme that includes site-building functionality such as Divi, creating a website from scratch becomes much easier. On the other hand, you can always opt for the manual approach if you’re not afraid of tweaking your theme. It can take longer, but it gives you more control over the entire process. While we can’t provide you with an outright estimate of how long it will take you to build a website, we can share our experience of how long each step of the process usually takes. Let’s begin with the planning stage! A lot of people just dive right into using WordPress without having a solid idea of what they want their websites to look like. There’s something to be said about that enthusiasm, but this approach will often end up costing you more time in the end due to additional revisions. What your website’s primary goal is. For some sites, their goal is to send business to a physical location, others want to drive online sales or get users to subscribe to a plan. The pages and elements you want your site to include. For example, a restaurant website might not need a blog, but it should include pictures of the location and instructions on how to get there. What similar websites do you look up to as inspiration. One of the best ways to design an excellent site is to take a look at what your most successful competitors are doing with theirs. Ideally, you’ll want to take notes about all this information so you can reference it while you work on your website. At this stage, it’s also a good idea to create mockups of what you want your site to look like. Those mockups can include as little or as much detail as you want. Either way, chances are your designs will change once you get to work on your pages. However, having visual references is still incredibly helpful, particularly if you’re working with others. Many get stuck here because there’s always room for more planning. However, at some point, you need to roll up your sleeves and get to work on materializing your website. For a small project, a week or two of planning or research should be more than enough. This is where things start to get real for most people. So far, your website is only an idea, but now you need to open your wallet and spend real money on it. WordPress-friendly features. Due to the platform’s popularity, a lot of web hosts offer WordPress-specific plans that pack in a lot of useful features, such as better performance across the board. Excellent performance. You want your website to load fast and to be able to weather traffic spikes. A lot of factors influence both those things and your hosting provider is one of the main ones. Reasonable costs. Hosting is such a competitive field that it’s easy to find solid plans for around $5 or less per month. When you’re starting out, it doesn’t make sense to blow your budget on enterprise hosting. We’ve written about some of our favorite hosts in the past, so that’s a good place to get started. Once you’ve paid for a plan, you’ll want to purchase a domain for your site. What name to use is up to you. You’ll likely want to opt for .com domains where possible, although that’s not set in stone. In most cases, one of these will set you back around $10-15 for a one-year registration, after which you’ll need to renew it for a similar cost. Overall, this step shouldn’t take you more than an hour or two, with most of it spent looking around for hosts and coming up with a domain name. Once WordPress is set up on your server, you may want to take some time to familiarize you with what each part of your dashboard does. The WordPress Codex is an excellent place to do this. When you’re ready to get down to business, your first move should be to pick the theme you want to use on your website. Mobile-friendliness. Your theme should enable you to build responsive websites right out of the box. Features that align with your site’s niche. There are specialized themes for nearly any purpose you can imagine, as well as multipurpose options suitable for most types of projects. Excellent reviews. Before you settle on a theme, you should check out what other users have to say about it – especially any mainly negative comments. Ultimately, however, you should pick whichever theme you feel more comfortable with. For your first WordPress website, using a free option might be a good idea until you’re comfortable with the platform. In any case, it shouldn’t take you more than an afternoon to set up WordPress and install a theme, and that’s if you spend hours comparing options. So far, most of the work we’ve done is about preparation. Now comes the part where you sit down with the theme you chose and get to work on the pages you want your website to include. You get access to pre-built page layouts. You can add pre-built modules to your pages and re-arrange them at will. 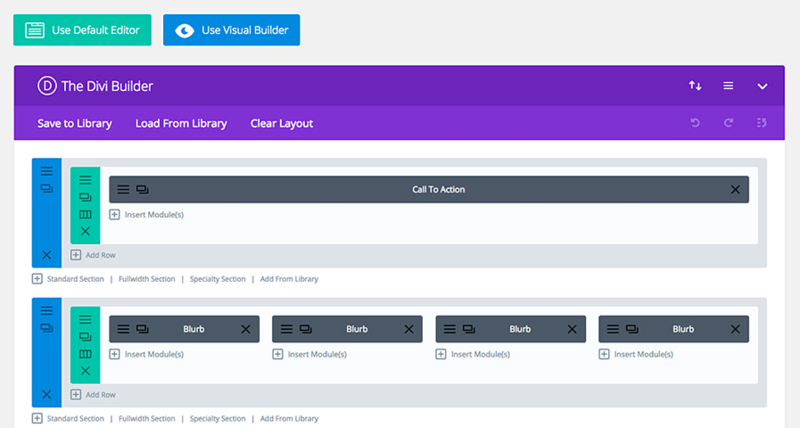 The Builder includes customization options for each module. You can use either a back or a front-end builder, depending on your preferences. We recommend you use a site builder if this is your first time working on a website and you’re doing things alone. However, if you or someone on your team has development experience, the manual route is also an option. Once you start putting your site’s pages together, you should have an idea of the kind of features you want to add using plugins. Just like themes, we recommend you stick to options with good reviews and also steer clear of any that haven’t been updated recently. Since this is the step where most of the work takes place, it’s also where most of your time will go. If you’re handy with a site builder, it can take you an afternoon or two to build an entire website. Otherwise, expect to spend at least a week putting everything together, and a few extra days making small changes or full revisions. For sites built manually, those estimates will rise sharply, depending on the size of your team and the scope of your project. Typos and non-loading elements. These are the most glaring type of errors and chances are you’ll find at least a couple of them if you look closely. Slow-loading pages. If your website feels slow at launch, it doesn’t bode well for its future – so make sure everything is optimized. Your site doesn’t look good on mobile. A lot of people make the mistake of focusing just on the desktop experience, which is a mistake in today’s day and age. In our experience, you’ll end up making at least a few last minute changes before your website goes public. However, we recommend you don’t sweat things out too much at this stage. Take a couple of days to go over your site, but don’t delay its launch too much unless key functionality isn’t working. After all, you can always continue to make improvements as you go along. If you want to build a WordPress website for a large business, the project can take months. After all, you’ll probably have multiple people working on it, and the site will go through multiple revisions. However, the smaller your scope becomes, the less time it can take to create an entire website. Find a web host and purchase a domain. Create the pages you want and install the plugins you need. Test your website and make any necessary adjustments before its launch. Do you have any questions about how long it takes to build a WordPress website? Let’s talk about them in the comments section below! Article thumbnail image by natashanast / shutterstock.com. The post How Long Does It Really Take to Build a WordPress Website? appeared first on Elegant Themes Blog.